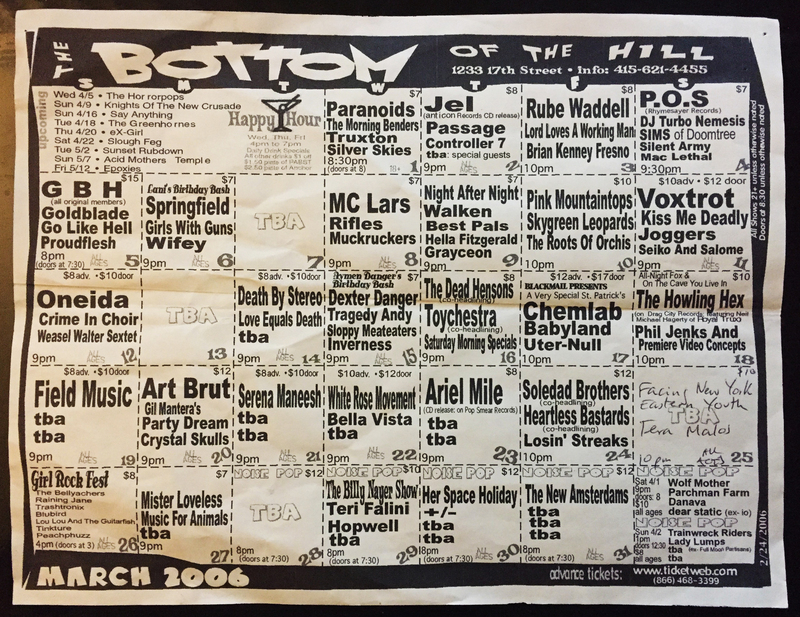 We (rather by accident) unearthed this Bottom of the Hill event calendar from March of 2006 today. A trio of us (while vacationing up in SF) ducked in on the 4th to see Minneapolis native, and lyrical monster P.O.S. perform a righteous show with his fellow Doom Tree alums DJ Turbo Nemesis and SIMS. If you aren’t already on this indie hip hop legend’s band wagon, strongly consider it. Smart music for smart people, kids. 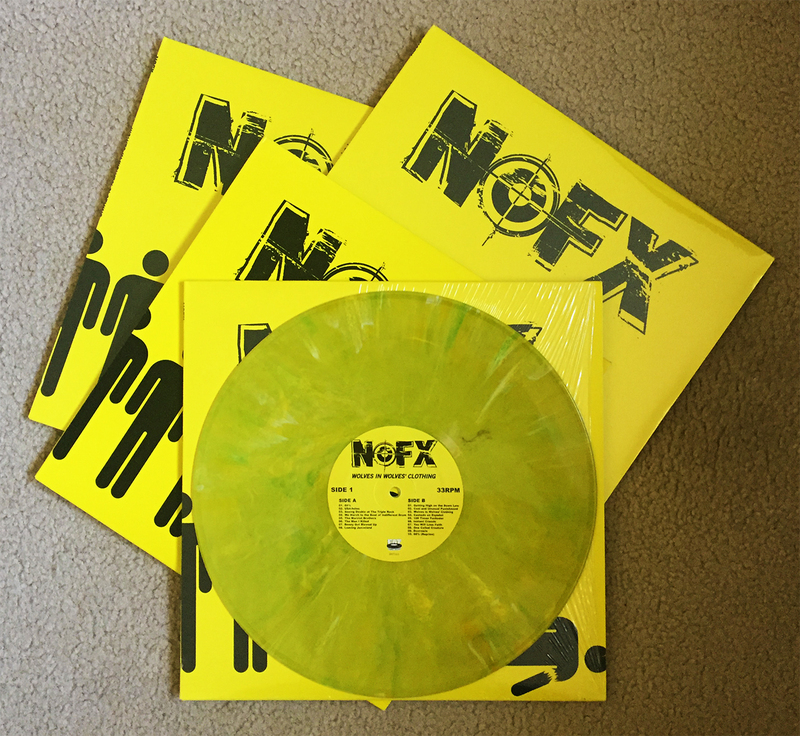 NOFX’s 2006 flop, Wolves in Wolves’ Clothing, came packaged as both black and yellow splatter vinyl. The latter with a pressing total of 1032. Back in ought six, I was able to procure 6x copies of this splatter nightmare. I’ve sold all but 3x copies, and only spin the black vinyl version when I’m feeling particularly randy. Anyway, Wolves isn’t as bad as people tell you, and you should give it a spin. 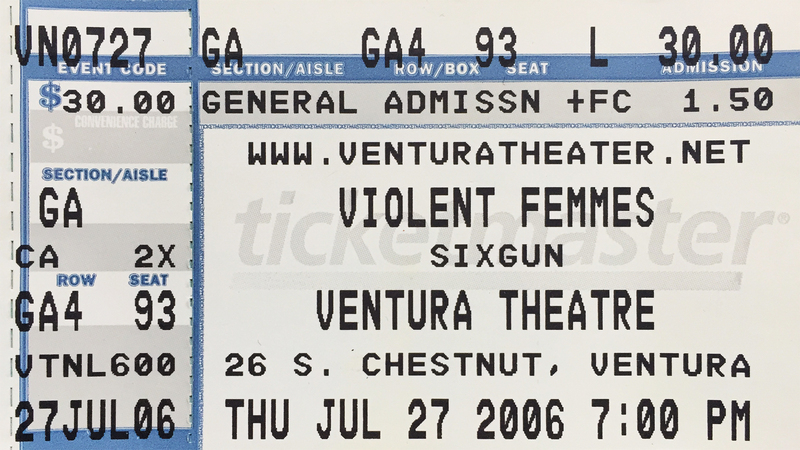 My one and only show at the Ventura Theatre during my film school tenure. Crazy to think that it was already 11 years ago. The Violent Femmes, they bring all their equipment on the bus. And, they did not disappoint. 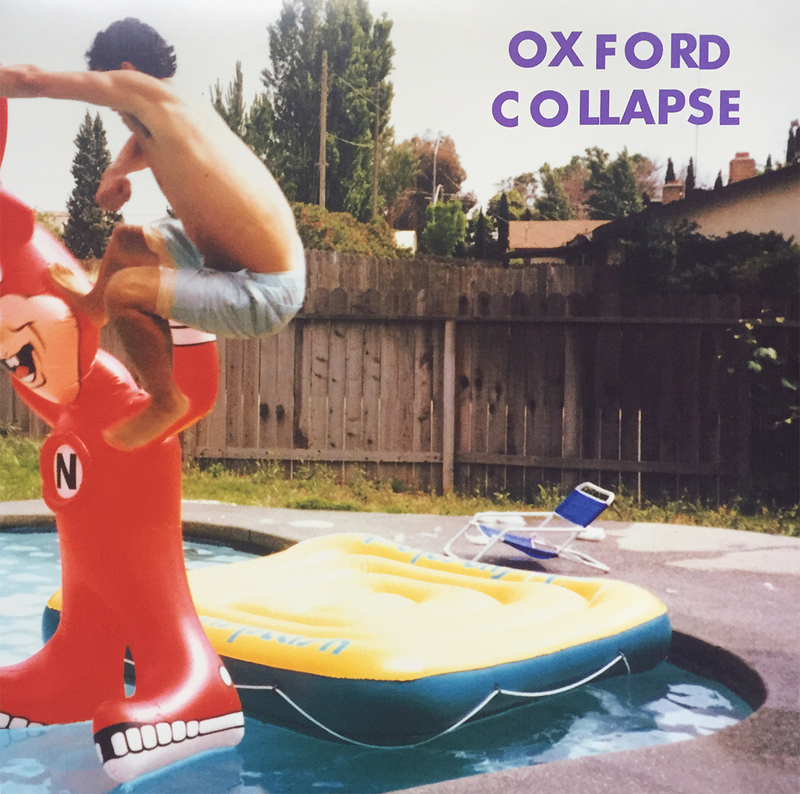 The (questionably) uncool, always entertaining Oxford Collapse (RIP) unleashed another indie rock classic with (late) 2006’s Remember the Night Parties. Is it cool to sing about National Parks (Please Visit Your National Parks), female practicers of law (Lady Lawyers), or black treacle (Molasses)? I don’t care one way or the other, because Remember the Night Parties is, from start to finish, an essential album. Top 50 all-time, I’d have to say, which is saying something, and nothing at the same time. 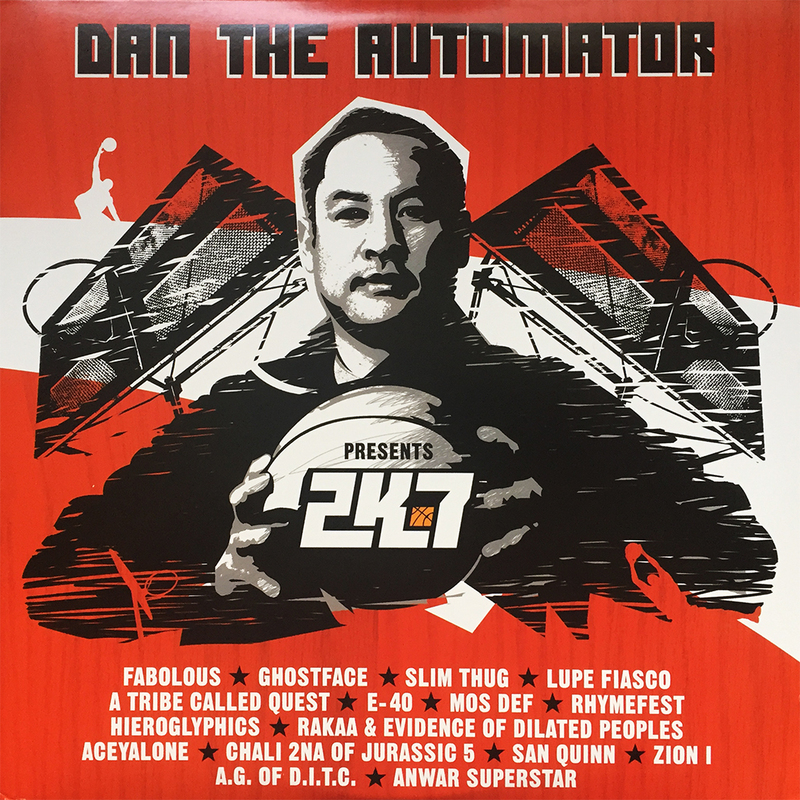 During my “all things Dan the Automator” phase I acquired, among a plethora of others, this 2006 soundtrack to the NBA 2K7 video game. 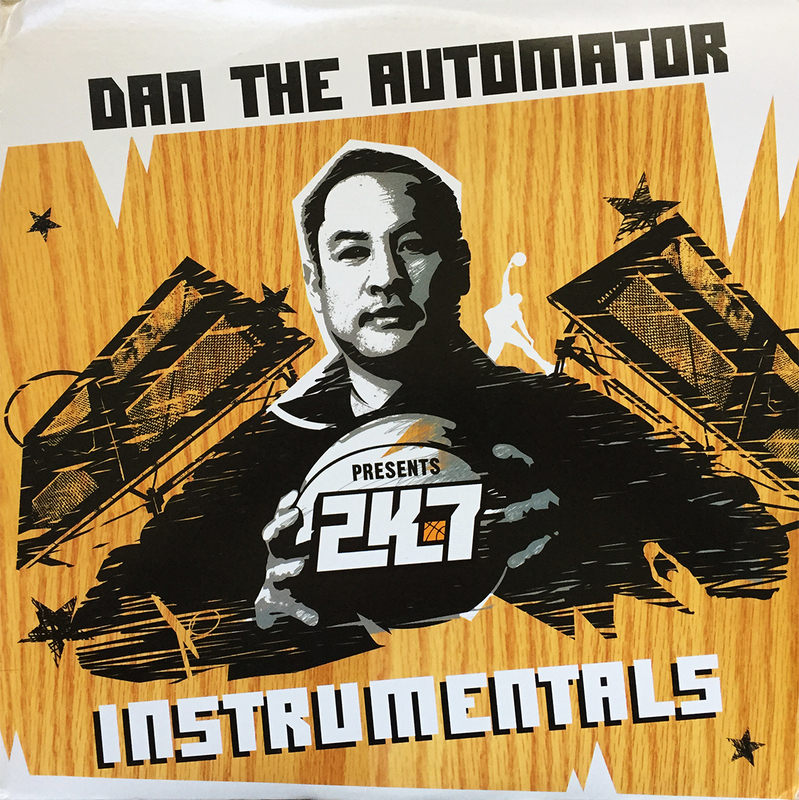 As can be expected, each track is b-ball themed in both lyrics and song title (Baller Blockin’, Fade Away, Don’t Hate the Player, to name just a few), and makes for a perfect companion to the 2K7 Instrumentals album (which I do not yet have). As with (almost) all DtA releases, there is a stripped down instrumental release to accompany the full, words-from-the-silver-tongue version. Kind of an intelligent way to get people to purchase two of (nearly) the same album. I’m game. As an avid follower of all things Mike Patton, I’ll confess that it’s taken a bit of research and development to man the interweaving road of his illustrious and diverse career. Irony is a Dead Scene (The Dillinger Escape Plan with Mike Patton) skipped past my radar upon its first release, but I was happy to find my way with the 2010 reissue. Now with social media playing a fundamental roll with any discernible artist with a “like,” information for upcoming releases don’t require as much legwork. Peeping Tom here, was an unplanned discovery during a time that (more or less) predated the uncomfortable knowledge of every artists’ every move. Gravy for us collectors, a bit awkward for the talent. Anyway, if you ever wanted to hear a wacked-out collaboration between Mike Patton, Dan the Automator and Norah Jones, Peeping Tom is your guy.